BANJUL, GAMBIA (AP) — Exiled Gambian ruler Yahya Jammeh stole millions of dollars in his final weeks in power, plundering the state coffers and shipping out luxury vehicles by cargo plane, a special adviser for the new president said Sunday. Meanwhile, a regional military force rolled in, greeted by cheers, to secure this tiny West African nation so that democratically elected President Adama Barrow could return home. He remained in neighboring Senegal, where he took the oath of office Thursday because of concerns for his safety. At a press conference in the Senegalese capital, Barrow's special adviser Mai Ahmad Fatty told journalists that the president "will return home as soon as possible." Underscoring the challenges facing the new administration, Fatty confirmed that Jammeh made off with more than $11.4 million during a two-week period alone. That is only what they have discovered so far since Jammeh and his family took an offer of exile after more than 22 years in power and departed late Saturday. 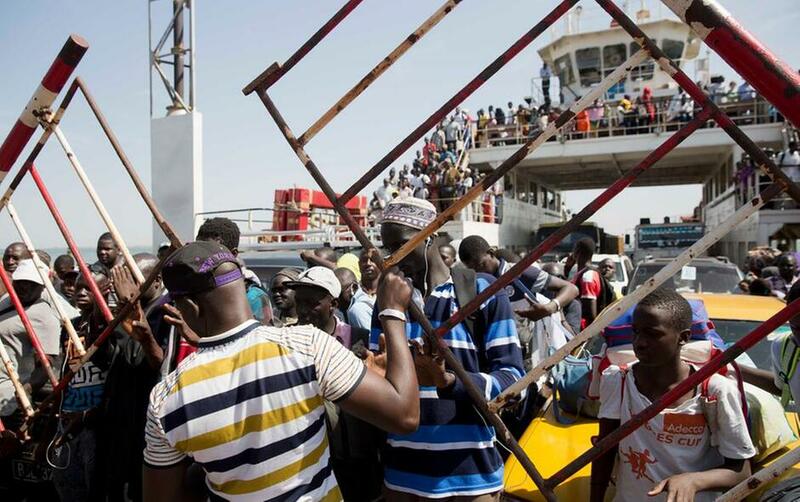 "The Gambia is in financial distress. The coffers are virtually empty. That is a state of fact," Fatty said. "It has been confirmed by technicians in the ministry of finance and the Central Bank of the Gambia." Fatty also confirmed that a Chadian cargo plane had transported luxury goods out of the country on Jammeh's behalf in his final hours in power, including an unknown number of vehicles. Fatty said officials at the Gambia airport have been ordered not to allow any of Jammeh's belongings to leave. Separately, it appeared that some of his goods remained in Guinea, where Jammeh and his closest allies stopped on their flight into exile. Fatty said officials "regret the situation," but it appeared that the major damage had been done, leaving the new government with little recourse to recoup the funds. The unpredictable Jammeh, known for startling declarations like his claim that bananas and herbal rubs could cure AIDS, went into exile under mounting international pressure, with a wave to supporters as soldiers wept. He is now in Equatorial Guinea, home to Africa's longest-serving ruler and not a state party to the International Criminal Court. Jammeh's dramatic about-face on his December election loss to Barrow, at first conceding and then challenging the vote, appeared to be the final straw for the international community, which had been alarmed by his moves in recent years to declare an Islamic republic and leave the Commonwealth and the ICC. Barrow's adviser disavowed a joint declaration issued after Jammeh's departure by the United Nations, African Union and West African regional bloc ECOWAS that bestowed a number of protections upon Jammeh, his family and his associates — including the assurance that their lawful assets would not be seized. "As far as we're concerned, it doesn't exist," Fatty said. The declaration also said Jammeh's exile was "temporary" and that he reserved the right to return to Gambia at the time of his choosing. Although the declaration was written to provide Jammeh with maximum protection, it doesn't give him amnesty, according to international human rights lawyer Reed Brody. "Under international law in fact you can't amnesty certain crimes like torture and massive or systematic political killings," he said in an email. "Depending where Jammeh ends up, though, the real obstacles to holding him accountable will be political." Barrow will now begin forming a Cabinet and working with Gambia's national assembly to reverse the state of emergency Jammeh declared in his final days in power, said Halifa Sallah, spokesman for the coalition backing the new leader. The president's official residence, State House, needs to be cleared of any possible hazards before Barrow arrives, Sallah added. The regional military force that had been poised to force out Jammeh if diplomatic efforts failed rolled into Gambia's capital, Banjul, on Sunday night to secure it for Barrow's arrival. Hundreds greeted the force's approach to State House, cheering and dancing, while some people grabbed soldiers to take selfies. The force will remain in the country "until such time the security general situation is comprehensively redressed," Barrow said in a statement. Marcel Alain de Souza, chairman of the regional bloc, said part of Gambia's security forces needed to be "immobilized," and he confirmed that Jammeh had had mercenaries by his side during the standoff. The former leader also had requested "a sort of amnesty" for him and his entourage and had wanted to remain in his home village, de Souza said. With Jammeh gone, a country that had waited in silence during the crisis sprang back to life. Shops and restaurants opened, music played and people danced in the streets. Defense chief Ousmane Badjie said the military welcomed the arrival of the regional force "wholeheartedly." With proper orders, he said, he would open the doors to the notorious prisons where rights groups say many who have disappeared over the years may be kept. "We are going to show Barrow we are really armed forces with a difference, I swear to God," Badjie said. "I have the Quran with me." Some of the 45,000 people who had fled the tiny country during the crisis began to return. The nation of 1.9 million, which promotes itself to overseas tourists as "the Smiling Coast of Africa," has been a major source of migrants heading toward Europe because of the situation at home. "I think it will be safer now," said 20-year-old Kaddy Saidy, who was returning to Banjul with her three young children. Barrow, who has promised to reverse many of Jammeh's actions, told The Associated Press on Saturday he will launch a truth and reconciliation commission to investigate alleged human rights abuses of Jammeh's regime. Rights groups say those include arbitrary detentions, torture and even killing of opponents. "After 22 years of fear, Gambians now have a unique opportunity to become a model for human rights in West Africa," Amnesty International's deputy director for West and Central Africa, Steve Cockburn, said in a statement Sunday. Larson reported from Dakar, Senegal. Associated Press writers Babacar Dione in Dakar, Senegal; Youssouf Bah in Conakry, Guinea; and Abdoulie John and photographer Jerome Delay in Banjul contributed.